Well there we were this morning messing around, checking email and I asked Matthew if he’d like to do something fun… We all have our hero’s and one of Matthew’s favorites is John McCain. I had gotten an email that Senator McCain would be holding a town hall meeting just down the road in Sun City and thought Matthew might enjoy seeing him. “Really??? Wow…” And off we were to the front of the room. We sat in the second row with all the Republican volunteers and donors. Only when I sat down did I think about what we were doing. You know Matthew. We always sit in the back of church and at the back of any meeting but here we were up in the front visible to everyone… Then I looked across the room–TV cameras pointed our direction. Yikes. But there we were and fortunately, Matthew got caught up in all the buzz. Lots of people talking and smiling, enjoying themselves. And when the introductions began he could see Senator McCain just off to the side–right next to us. His American Hero. I was surprised that Matthew made it through the clapping and standing. I am sure he laughed at the few boos he heard. I don’t think he cared a whole lot about the Health Care Reform information that was being shared but he did seem to enjoy listening. If you watch the video you’ll spot us and I know you’ll think two things. One, someone should have told me to do a better job brushing my hair (where’s my daughter when I need her…) and two watching me rub Matthew’s neck and leg (which we always do when he has to sit and pay attention) is quite annoying. I doubt they would have put us in front had the gal realized Matthew was autistic but I am glad that he could sit there and be a pretty good representation of someone with special needs. Oh, and what did the Senator say??? I’m going to have to go back and watch the video. Yep, we made it safe and sound. Took the car back, had a nice hot breakfast at the hotel, caught the shuttle bus just as we walked out, no line at the airport and the plane was on time… what more do you want? Well, we were treated to a “tour” of Mt. Rainier. And I mean an amazing aerial view. I am thinking that it must be very unusual for the mountain to be so clear although maybe every pilot takes a big dip and curves around the mountain so we could see all sides and even look up to North America’s second highest peak. What a great way to cap off our visit to the Pacific Northwest. So we got home, searched out our scaredy cats (who had gone in to hiding the past several days) and then ate our traditional post vacation Mexican Food dinner. And now that it’s past 7pm my electricity has kicked into high gear and we are pretending it’s cool here. I’ll unpack suitcases and do wash tomorrow. Tonight we are just relaxing and talking about what was most impressive for each this trip. 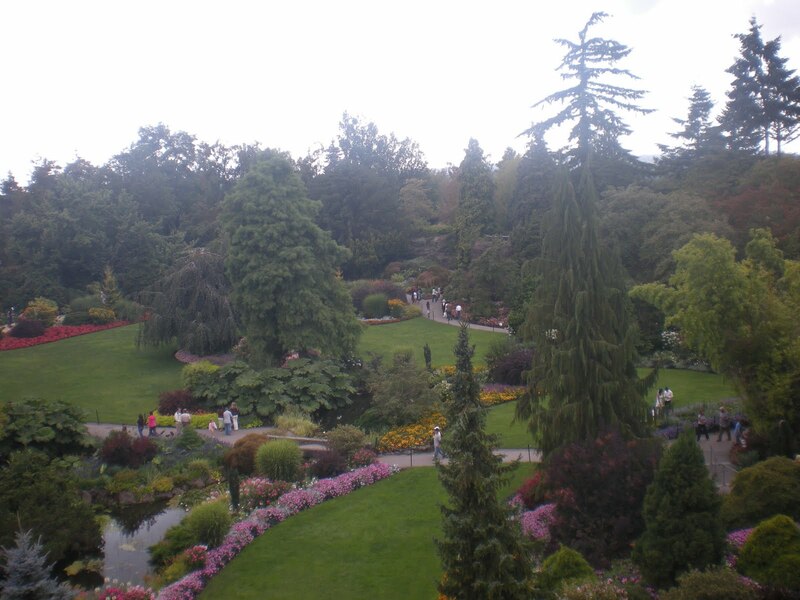 As I expected, Rebecca thinks the Butchart Gardens were the most amazing. And truly it is. We drove up through the countryside on a little two lane road (thanks to the unique mapping our GPS chose) and from this very rural, treed area you find yourself in the middle of Eden. I hope you get to visit here. Bob thought that the best part was our drive up to Mt. Olympus and Hurricane Park. Matthew too, was very happy to see the deer so close up. Bob and the kids had never seen a glacier and to see it through the fog was pretty cool. Matthew and I are still shaky from our hair-raising experiences across the Capilano bridge and up to the top of the Space Needle. I told Bob we were able to say the whole 23rd Psalm on the ride up. The view from both places was indeed spectacular but we are both very glad to be home with our feet firmly planted on the ground. Thought you’d appreciate these two pictures today. 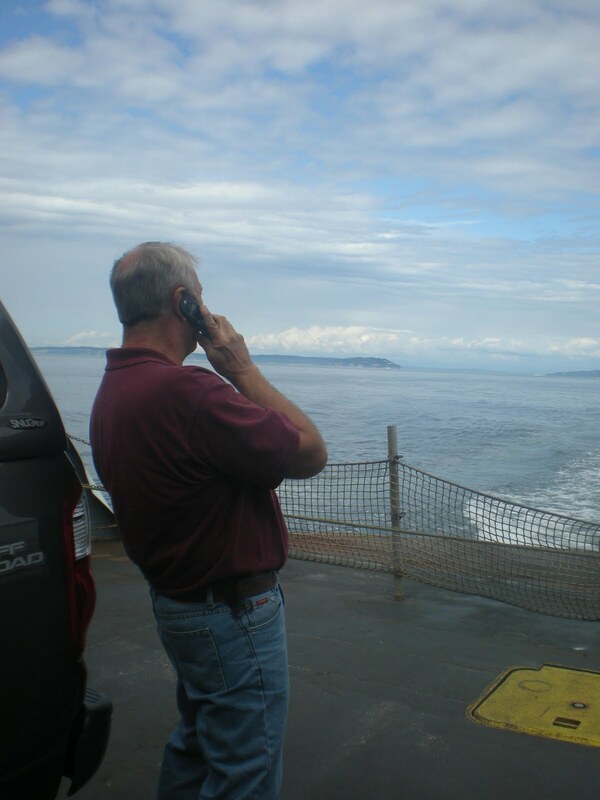 If you have ever spent any time around Bob you know that his cell phone is his umbilical cord and there is always someone calling from work. Here we are on the ferry and he was gabbing on about this, that or the other with one of the guys. He even had service in Canada but when I reminded him he might have to pay $$ for the international fee he quickly turned it off. And here are the sweet children entertaining themselves… ah, life is good. Today was pretty special. We got to spend the day with my friend Dorcas. 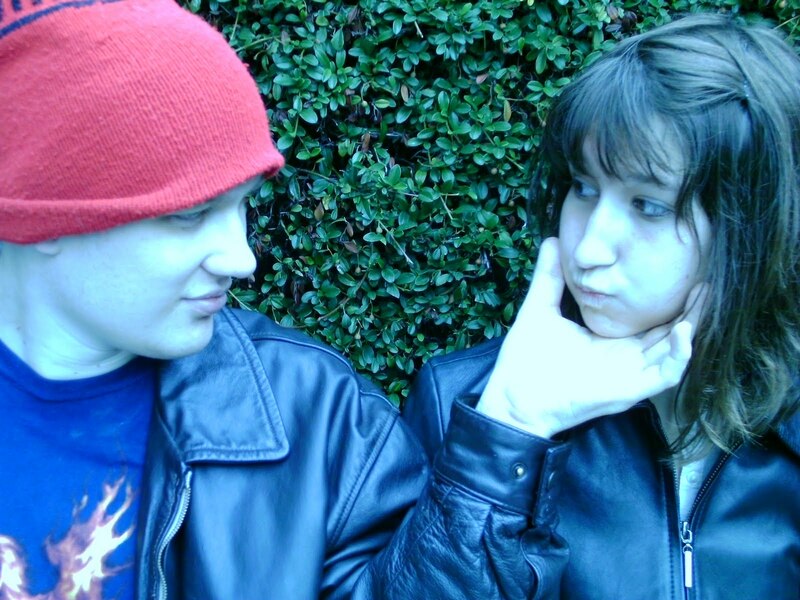 She was the first person I met when we moved to Sitka as a 7th grader. Rebecca asked if I thought Dorcas was the same and I have to say she is. Same cheerful person, with lots to share. We had a great time visiting and catching up. The weather was absolutely beautiful here today. It might have reached 80 and there was always a breeze. So we walked from the hotel to Pikes Fish Market. The kids were impressed with all the fish and seafood but especially the show put on by the guys working there. When they toss fish through the air and chant it’s pretty amusing. The market area is filled with small shops and a farmer’s market. I loved all the cut flowers available at such low prices. We would have bouquets everywhere in the house if I lived here. Dorcas wanted us to visit another unique place so we drove a short ways to Snoqualmie Falls. 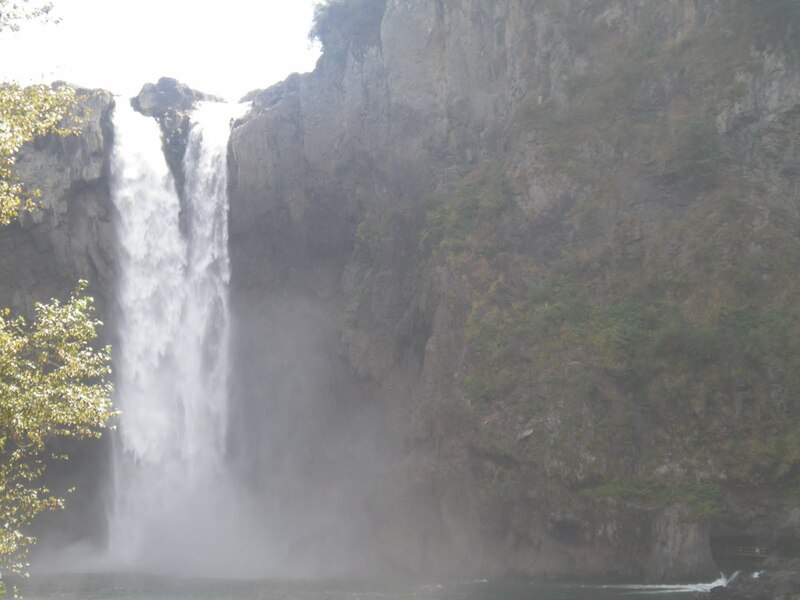 The water falls were fun to look at from the top but we decided to be adventurous and hike to the river down below. I can tell you that walking down the trail was not too bad but the hike out… well, let’s just say we were all glad for the many shady spots where we could catch our breath. I tried to reach a ripe blackberry in the middle of the thicket thinking it would quench my thirst and instead got caught up in the bush. Today was a great way to wrap up our trip. We are packing tonight and heading back to hopefully cooler Phoenix tomorrow. Rebecca is looking forward to evaluating the Sea-Tac airport. She thinks it’s pretty hard to beat Sky Harbor. 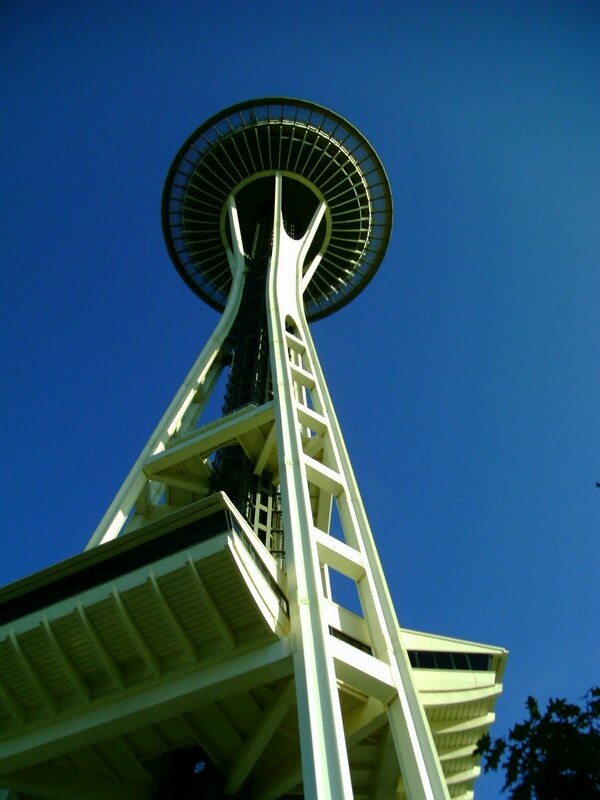 Rebecca’s Perspective: Another great day to our trip, I’m so glad we had a Seattlelite show us around! Dorcas was our tour guide to the little known spots near Seattle, as well as the very famous Pike Place Market! She even took us to the very first Starbucks! The place that started it all. How cool. 🙂 Across from the fresh flower and fruit market place, there were assorted bakeries and delicatessens, even a cheese shop where we all tried some curd cheese! Matthew was very excited to see a bakery that had a whole gluten free section, something that is becoming more popular in the Seattle area. 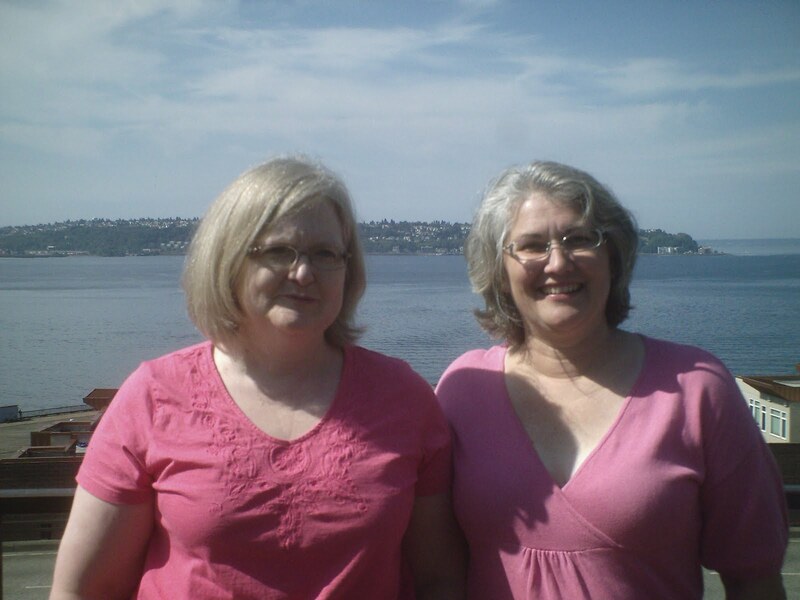 After seeing the falls and having a giant lunch, we drove to Kirkland to enjoy a scenic view of Lake Washington. Beautiful weather made the day perfect for such outdoors activities. Rebecca’s Perspective: What a beautiful day in Seattle! Not a cloud in the sky, got the sun in my eyes, and I won’t be surprised if it’s a dream… 🙂 (for all you Karen Carpenter fans out there.) Today was a lot of traveling; about an hour of which was spent waiting to cross the border back into the US. The line was pretty insane. We thankfully all had our passports so when we got to customs we moved right along. In the midst of our trip back to Seattle, we took a detour to see Whidby Island. It was very scenic; Mom’s got a house picked out for me to buy her (when I manage become a millionaire, I think.) right on the coast of Washington. After we got into town, we ventured on the monorail to the SPACE NEEDLE!!! Oh boy, was that … well, maybe not exciting, but something that sure got your attention. While Mom and Matthew weren’t too willing to walk along the edge, Dad and I did boldly go where I hadn’t gone before. I was pretty nervous out there, but as long as I didn’t have to look down I was okay. Of course the occasional accidental glance had me hanging tight to the wall, though. Tonight we’re staying downtown, and tomorrow we’re looking forward to seeing my mom’s friend Dorcas and walking around Pike’s Place Market as well as some other nearby attractions! Oh that Rebecca. Karen Carpenter. Sounds like she listens to the Oldies radio too much. We are back in the good ole US of A. And it’s a good feeling. I knew for sure we were back when we spotted a group of veterans protesting the Health Care Reform program being proposed. I thought it was interesting that they were out maybe there was a Town Hall meeting in the small town we were in. Today was just perfect weather here! We’ll be miserable when we get back to Phoenix…unless fall has suddenly hit. 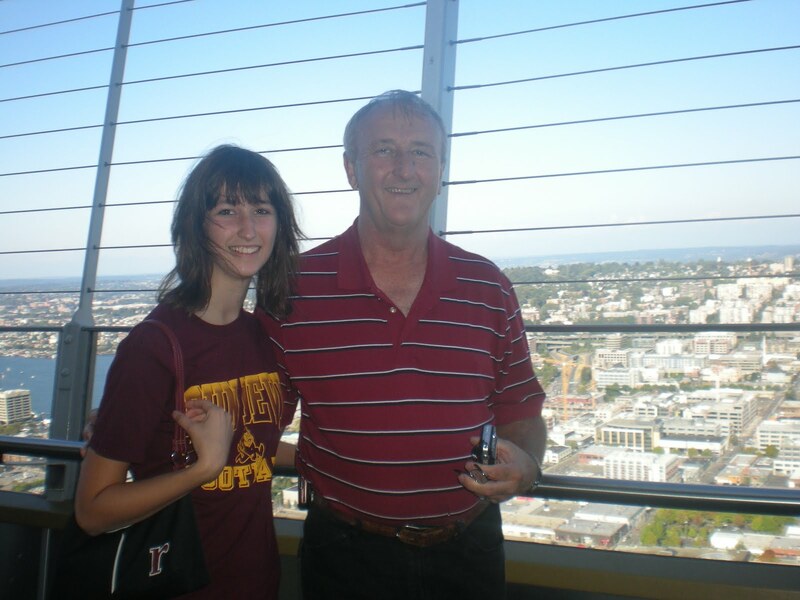 As Rebecca mentioned we bravely rode to the top of the Space Needle and for Matthew and me once was enough. We thought it was a beautiful view but I had to keep Matthew looking at me on the ride since he was quite nervous. He was funny though when we got down close enough to see the tree branches he kept saying, “Ahhhh. Whew…” I’m telling you we have never tested our bravery so much as this trip. The sun is just thinking about setting as I write this from our 18th story room so I’ll wrap up. We can’t wait to see the fish being thrown around at the Fish Market tomorrow and I am very much hoping that we can eat lunch at our family’s year old favorite restaurant down on the wharf. It was fun to ride the ferry to Vancouver this morning. The kids were entertained by a naturalist who talked about the sea life in the area. Matthew and I saw a seal and Rebecca spotted a dolphin. Look as we might, we didn’t see any orcas. The picture here I was going to label “The Face of Fear” but Rebecca thought it would be better titled “Three Brave Souls”. 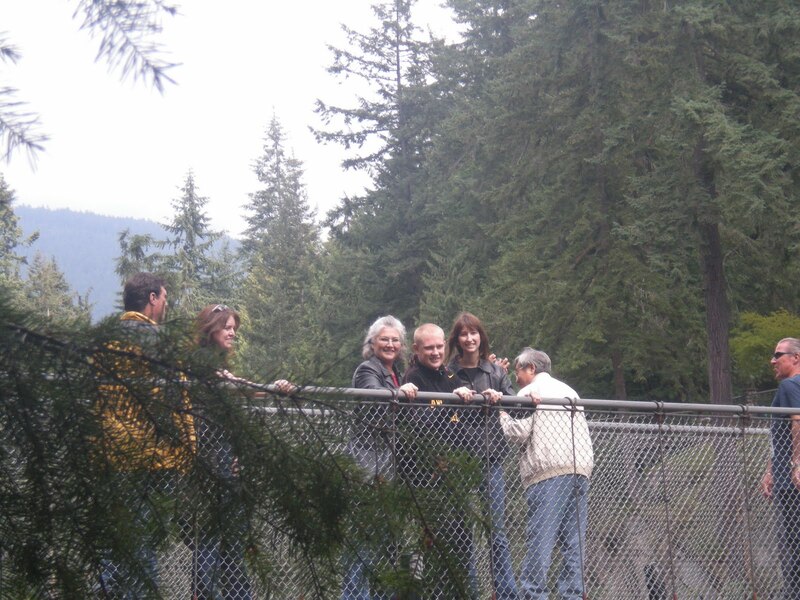 This was taken as we walked across the suspension bridge over the Capilano River north of Vancouver. Truly it was amazingly scary… I think walking across is easily worth several years off time served in Purgatory… Matthew thought it was funny as the bridge swayed until we got past the trees and were out in the open. Then I had to convince him to keep going. We visited here our first time through and only the bridge is the same (if that). This has turned into a major tourist mecca with fees and high dollars at every turn but still, it is a fun and very unique place to visit. Tonight we drove through Chinatown. Because we didn’t need a flat, dried duck we didn’t make any purchases… This and the rest of the city center area reminds me of San Francisco. Very interesting place. 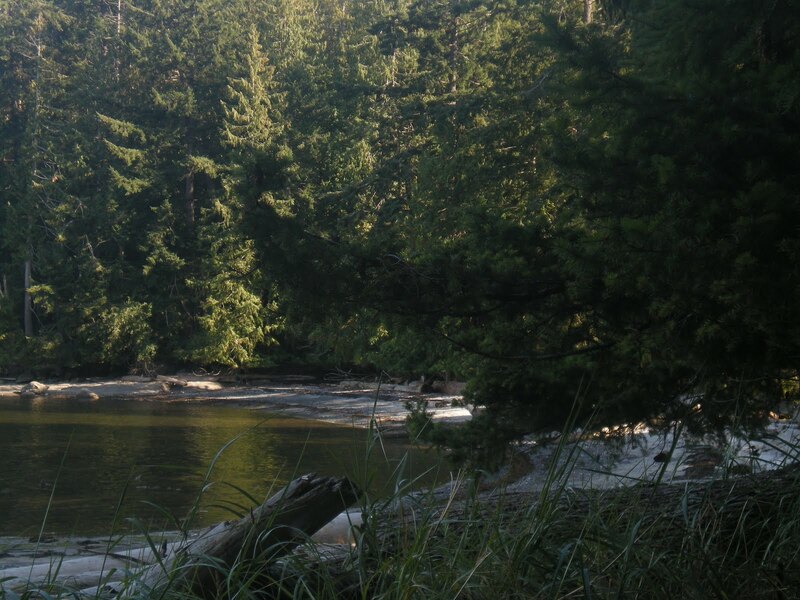 Rebecca’s Perspective: What a beautiful day spent on both Vancouver Island and Vancouver! At about 65 degrees and wind, I felt quite comfortable with just my long sleeves and jeans while other tourists and Canadians were bearing shorts and tank tops! Really, the bridge was not quite as frightening as my mom makes it out to be– you just have to not look down, not let go of the sides, and pray that the 8 year old boy stops jumping and making the bridge sway more. 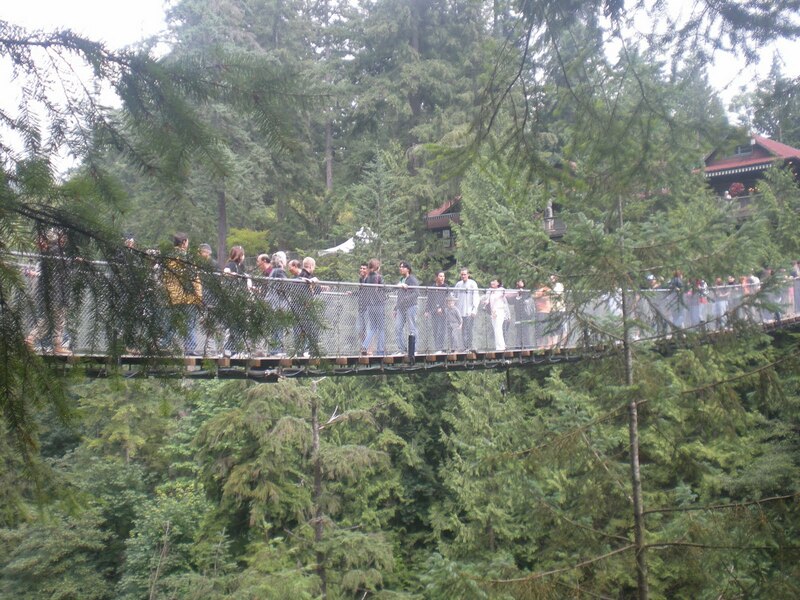 We also found that the bridge isn’t quite as bad when it is crowded with people. We crossed the middle segment alone the first time across, and with no one on the other side, boy did we lean! Balance is key. But the area surrounding and 230 feet below was beautiful and scenic as one might expect. We also saw many weddings take place at the Queen Elizabeth Gardens, a smaller version of Butchart right in the heart of Vancouver! I could just see myself there in a few years on a beautiful summer day, my wedding party surrounding in the lush gardens… though Mom and Dad seem to think this won’t take place for another 20 years. It’s a beautiful morning here today. Partly cloudy sky and a breeze. We are taking the ferry across to Vancouver in a little while. I expect we’ll be glad to have our jackets. I woke up thinking about some of the differences between our Canadian cousins and us. If you’ve been up here before you’ll probably be able to add to my list. • Locals often do use “Eh?” at the end of every sentence. Why? I don’t know. But they do, eh. • People seem to be very friendly. Of course, this Bob would know because he has engaged everyone in conversation…well, except of course, the Customs Agent where I warned him that he was to only answer their questions. • People walk everywhere…we have had to watch out for pedestrians on the road. I know, if you are not from the Phoenix area this might seem a pretty lame observation and yet who walks in Phoenix??? We’ve decided this is most likely due to the 40+ degree temperature difference. I too would walk more if I didn’t break into a sweat just stepping out the front door. • Here’s another possible AZ observation…there seem to be a lot of smokers here. Can’t say I know why and it seems to contradict the healthy lifestyle of walking. • Bring your wallet to Canada. It may be because we are in a tourist area but so far prices, especially for food are quite thinning. Last night we were told about a family restaurant that was really good but discovered on Friday nights they offered a “Frugal Friday” special of half off everything on their menu… you can’t imagine how long the line was. We ate at A&W. • Homeless people are everywhere. And they don’t stoop to eating the wild berries along the roads. At least according to the park ranger we talked to. • 80 means 50. Ah, that metric stuff again. They have signs posted just as you get off the ferry reminding us Americans that 80kph is the same as 50mph. The good thing is that Bob feels like he is driving faster when he sees the 80 or 90 signs. • Speaking of metric, I think they took away the Imperial gallon here. Now it’s all listed in litres. Gas prices also seem to be set as there was no variance within the city. Last night we paid 102.7/l (a hundred and two cents plus 4tenths…what the heck is that?) You can figure out the actual price as compared to the US… I just told Bob to stop at $20…and the gauge did actually move. • Canadian money is cool. The bills are colorful but more interesting are their $1 and $2 coins. They are called Loonies and Toonies. Yes, they do say this with a straight face. Okay, it’s time for breakfast. Bob has already checked out the restaurant and found good things for Matthew so we’re off. Hope to see whales today. 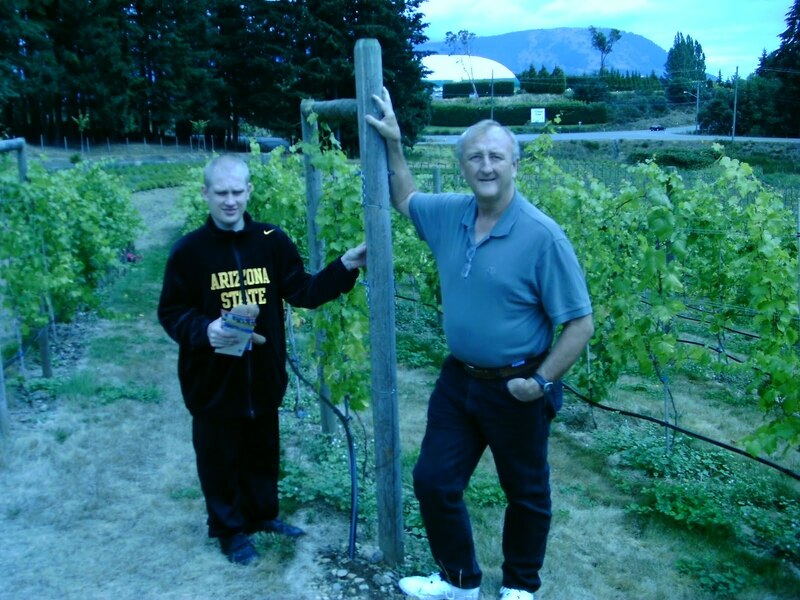 I was surprised to see wineries in this area. We stopped to take in a lavender farm and learned that there are several very good wines that come from this area. As Bob was driving I thought I could see berries alongside the road. Sure enough we discovered that blackberries were just turning ripe. Well, after tasting them we decided that they would make a great treat. We emptied our McDonald’s cups and filled them with the sweet berries. Matthew refused to take a cup as he just choose to eat them right off the bush. I thought Rebecca was doing better until I realized she had only a few berries in her cup and also had chosen to taste test. Most surprising was when I looked under one of the blackberry bushes and discovered a red juicy plum. There was a wild plum tree protected by the stickery bushes. I was able to snag enough for us to all to taste them. The weather here today was absolutely beautiful. We took advantage of it and rode a small ferry out to explore a little island. Again we followed “the road less taken” as we hiked across the island. According to the map we walked 4.2km–brownie points to you if you know how many miles that is off the top of your head. The ferry driver kidded us about telling all our Arizona friends about this beautiful spot. He preferred that we keep it a secret. There is no doubt it is very beautiful here but I have a feeling that it takes a lot of rain and cool humid days to make it so green.